A week ago I was on a state legislative panel about the regional implications of global climate change and some climate policy folks on the panel described a range of unpleasant local effects of increasing greenhouse gases: coastal inundation from rising sea level, droughts, an increase in severe storms, serious flooding on local rivers, extreme precipitation, insect infestations killing forests, heat waves, and ocean acidification killing local shellfish, among others. Cliff doesn't say which state. There were several clues by which one can narrow down the state legislative panel. For example, the parts about rising sea levels, droughts, extreme precipitation and insect infestations. My guess is that the state legislature was on the west coast of the USA - Washington, Oregon or California. Cliff hails from Washington State but there were no panels held on climate change there that I could find. I don't have time to look up all the different jurisdictions. It doesn't really matter except I would have liked to have checked what Cliff reported against what was actually presented - and by whom. Update: Dan McShane in the comments has provided a link to the presentations - click here. Sou. The list was biblical in length and severity. All that was missing were the frogs and boils. I think what Cliff is implying here is that the predictions couldn't come true because they suggest climate change will have serious consequences. Perhaps Cliff doesn't think that the consequences of a 2, 4, 6 or more degree rise in average global temperature will be serious. Or, more likely, his mind cannot cope with the severity of the risk so he makes light of it. It's a natural human reaction but not one you'd expect from a meteorologist who, during his studies, should have learnt at least a little bit about what shapes climate. Cliff went on to say how people's eyes glazed over "as the endless list of disasters were described. " Instead of pondering how to wake the audience up to the reality of climate change, I reckon Cliff joined in with glazed eyes of his own. Cliff said that "climate policy advocates" (surely by now all legislatures have a policy on climate change) provided "extraordinarily specific predictions--such as the snow pack being reduced by 35% in a certain year." Now that would surprise me. Perhaps not only were Cliff's eyes glazed but his ears weren't working too well either. I suppose the person could have said that. However I consider it more likely that the climate experts were predicting that the snow pack would be reduced by 35% (on average) by a certain year, not "in a certain year". And with provisos, such as those relating to the quantity of CO2 in the atmosphere. At least that's how all the projections I've seen are expressed. And the scientists showing what's ahead of us also point out that in future there will continue to be natural variation such that there can still be a heavy snow year as well as a virtually no snow year. The reason I suggest that Cliff's ear's had stopped working was because he indicated that by this stage not only were the audiences' eyes glazed over but there was "substantial" rolling of eyeballs. Glazed rolling eyeballs would take some getting used to. It would be safe to say if Cliff were suffering such a malady it would distract him from listening. Even if he were merely watching such an impressive display he would be seriously distracted and likely didn't hear what the speakers actually spoke. He did say he was busy worrying that some eyeballs might fall out of their sockets. Cliff might not be skilled at multi-tasking. You can tell Cliff's mind was wandering because after this he lurched backwards into some yarns from the Old Testament. I think he was intimating that he was a Pharaoh, or that the elected representatives were Pharoahs or something and should act like the Pharaoh of old who took no notice of Moses' prophecies. He said that Pharaoh's advisers advised that Moses' prophecies could happen with natural variation. Maybe Cliff is playing one of Pharaoh's advisers. Which reminds me of the talk given by Sophie Lewis last week, where she told us that it was virtually impossible for Australia to have had a year like last year without the extra greenhouse gases in the air. Her experiments suggested that the chances of 2013 happening without AGW were at most one year in the past 13,000 years. That's long odds. Now I might be reading Cliff's blog all wrong. Americans aren't known for subtlety but it could be that he is sending a subtle message to his fellow scientists that they need to present the science in a less boring way. In a way that won't glaze eyes, roll eyeballs or cause eyeballs to fall from their very sockets. Not successful in getting action using threats of environmental disaster to promote change. 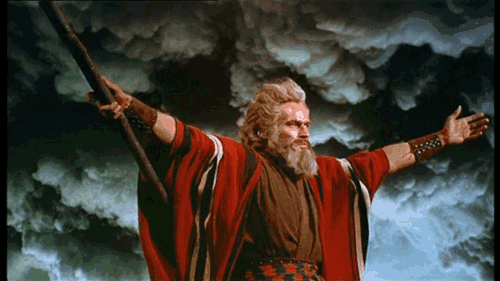 Not even Charlton Heston dressed in flowing robes and waving a big stick would impress climate science deniers! "And God blessed them: and God said unto them, Be fruitful, and multiply, and replenish the earth"
Time to do the replenishing part. Maybe that was Cliff's subtle way of letting us know he was "taking the piss". Taking the piss: mocking the listener by telling them a tall tale to test their gullibility. Often but not always in a friendly, light-hearted way. Does not involve urinating (to piss). Does not (necessarily) involve imbibing alcohol (a piss-up). Thanks, Dan. Those presentations were interesting in that they were quite a bit more detailed at the regional level than would have been possible a decade ago, I'd say. Cliff Mass' presentation was a bit different in some respects from the first one, but he probably had more in common with them than he had different. Like many other places, Washington State is going to have to make some big adjustments over the next few decades. Like you, I was curious about the presentations Dr. Mass discusses and found his material not really that different than his fellow Univerity of Washington folks. I have been a reader of Cliff's blog for a long time (it is a good blog). He has become over sensitive to how AGW is presented to the point that his actual views on the subject get lost and he has become a bit lost in arguments about how AGW should or should not be presented. A waste of time since the barn door was open a long time ago. The AGW denier movement is chewing its own feet off, and we get this kind of distraction. This is not the way to press home an advantage. I'm not alone in somehow overlooking claims that some single event proves AGW, despite taking a keen interest in the subject. What I am very used to is AGW deniers saying "Warmists will say that this proves AGW", right before nobody does. IMO, AGW and extreme weather events should always be linked in the general form "We can't say that climate change caused [event x] but ...", which brings the two concepts to mind together where they can form a desirable conceptual dimer, in the right environment. Another desirable conceptual dimer links "AGW denier" and "whackjob", but that's being handled for us by well-qualified volunteers.. I would imagine if people were on an airliner headed for a forced landing in the middle of the Pacific Ocean, their eyes would be wide with terror and foreboding. They would be praying to the mystical god of their upbringing and hoping for a miracle. This is precisely the situation we have on Spaceship Earth. Yet they have glazed eyes that roll inverted. They are morons! "Cliff Mass wins this round"